Welcome to Auto Secrets Revealed, a newsletter dedicated to you - the automobile enthusiast. Auto Secrets Revealed helps you save money in many different ways. These include repairs, dealing with salvage yards, finding honest mechanic or auto body shops, finding specialty parts for sale, auto parts shopping tips, online coupons, new or used car purchases and everyday driving expenses. But that's only the beginning. In every issue you will find repair tips, tutorials, videos, coupons, and other money-savers. And it's all free! Each week we feature a variety of exciting articles. For example, learn about Car Care - From Routine Maintenance to Complex Repairs; How to Shop for Parts: Secrets of Expert Parts Shoppers; Street Racing; Performance Parts Guides; New Accessories - all geared to help you enjoy and have fun with your car. So click on the link below. 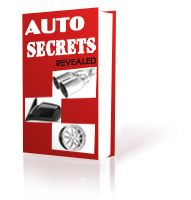 Start reading and benefiting from Auto Secrets Revealed today.